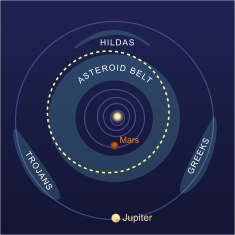 The orbit of Hygiea within the Asteroid Belt between the orbits of Mars and Jupiter. Hygiea is the fourth largest of the Solar System's asteroids, with a diameter exceeding 400 km. Its orbit carries it through the main Asteroid Belt, some three Astronomical Units from the Sun.